A cuttlefish with its mandibles (beak) visible, perhaps it was thinking of taking a bite? Always popular with divers and underwater photographers at Pulau Hantu were several species of stunning nudibranchs feeding and living amongst the corals! 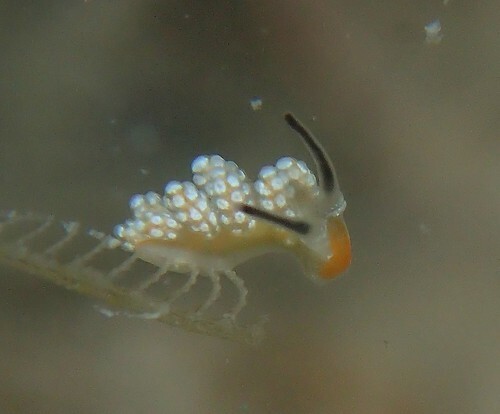 This tiny nudibranch of the Doto genus sits perched atop a hydroid coral. It reminds us of an ant that has somehow found its way underwater! A close-up shot of a particularly charming-looking Bornella anguilla. This beautiful nudibranch is from the Trinchesia genus. The vivid colouration could deter predators in search of a meal. 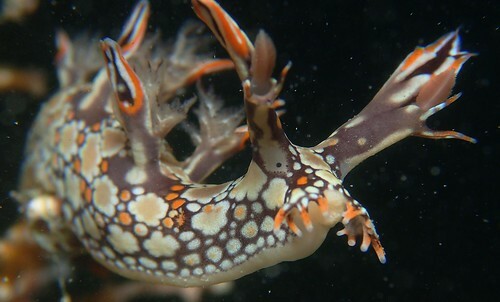 For anyone curious to learn more about nudibranchs, I recently wrote a short article that describes what they are and what they do! Nudibranchs are one the most common non-human animals found on the Hantu reef, but there are many other creatures to be found, such as fish! 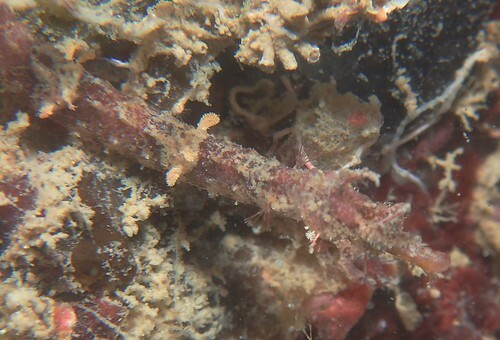 A juvenile winged pipefish lies buried among the sediment. Pipefish survive by blending in with their environment to avoid predators. 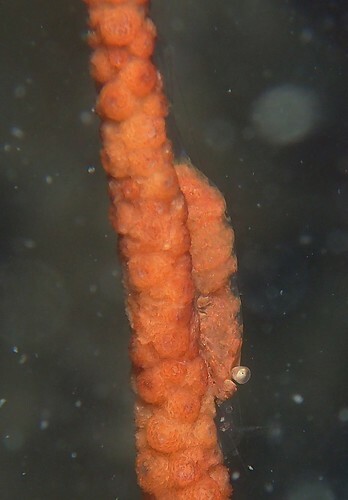 Can you spot the pipefish (and its little “wings”) in the image above? It is thought that the wings of the pipefish help break up its straight-edged outline to give it better camouflage. Pipefish usually keep very still to avoid attracting predators’ attention which also makes them easier to photograph! 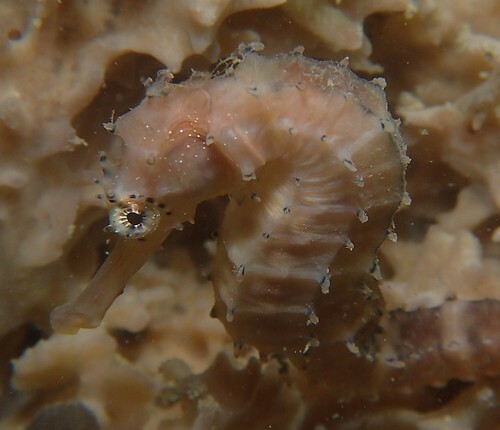 This dainty seahorse was also spotted camouflaged among the coral. They may not look like it, but seahorses are fish – they breathe through gills and have a swim bladder! Seahorses and pipefish are close relatives. Could you have guessed that from their similar shape, colouring, and camouflage strategies? 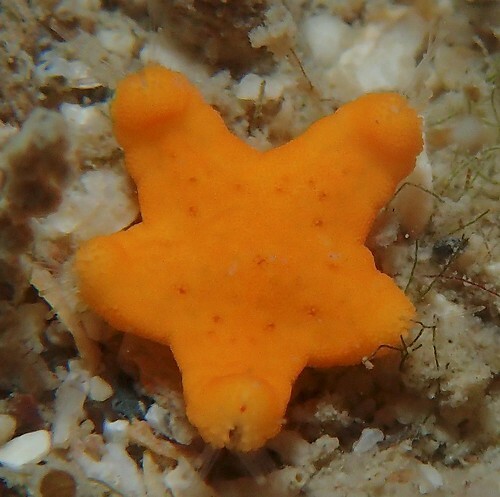 A bright orange sea star from the reef. 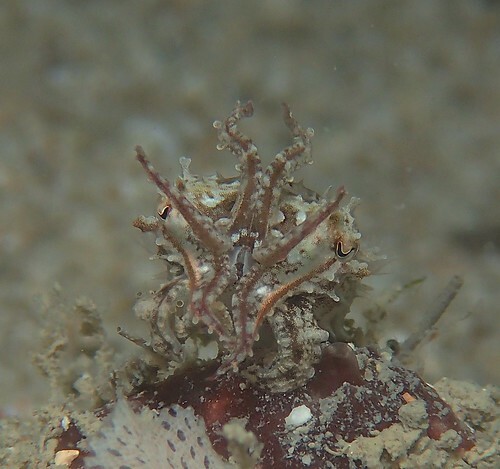 A brittle star with its mouth clearly visible. Although these two seastars look quite different, they are closely related. 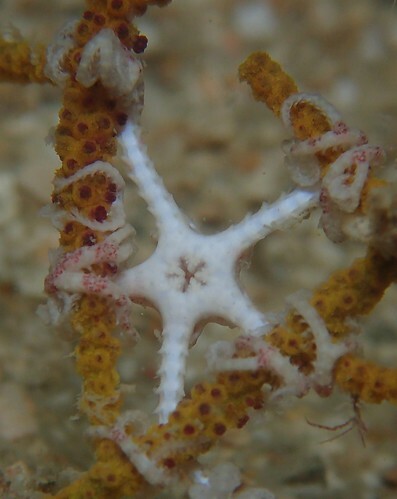 Even though seastars are sometimes called starfish, they aren’t fish at all! Aside from the more recognizable creatures of the reef, Chay Hoon also spotted a skeleton shrimp blending in with the background. As their name suggests, skeleton shrimp have thin bodies that allow them to hide among the debris. 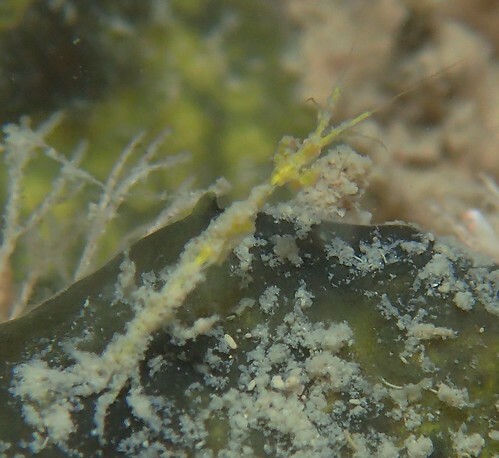 Does this tiny whip coral shrimp have better camouflage than the winged pipefish? 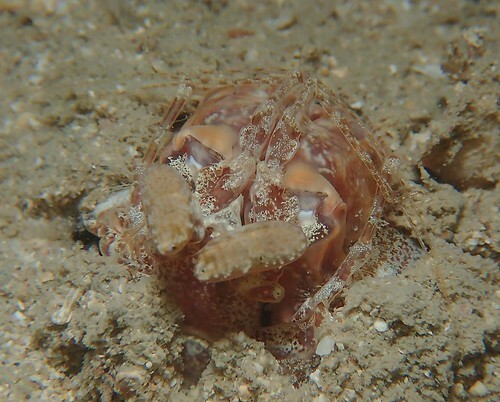 Perhaps the most exciting creature photographed during the trip was this juvenile mantis shrimp! Mantis shrimp have a variety of amazing attributes. Mantis shrimp can move their pincers at incredible speeds, spearing or bludgeoning their prey. 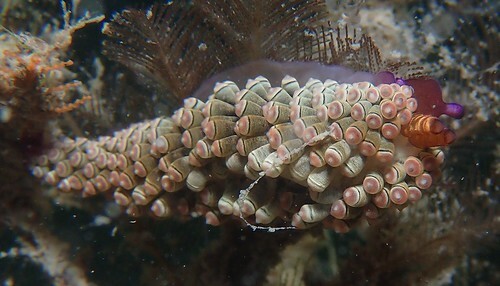 They can also see light in the ultra-violet and infrared spectrum and some species such as the peacock mantis shrimp develop beautiful coloration. One of my favourite (although slightly over-dramatic) tributes to mantis shrimp was written by The Oatmeal. The creatures spotted this month on the reef are a reminder that there is an impressive amount of biodiversity that can be found in our own backyard. Once we recognize the marine life that inhabits the environment around us, it becomes easier to love and protect our reefs!